MSNBC reported recently that a shot of carbon dioxide gas into the nose can help with allergies based on preliminary findings funded by Capnia, a company that makes the product. 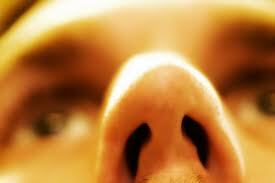 Symptoms of nasal allergies improved within 30 minutes. No liquid is involved... just carbon dioxide gas. I'll pass on this drug... There are already good drugs with minimal side effects that lasts up to 24 hours already on the market . Of note, some readers may point out that there is an older study that had better results. With two one-minute carbon dioxide treatments into the nose resulted in symptom relief within 10 minutes and lasted for 24 hours. Even with these results, I'll still pass... not sure how many people will go with 2 one-minute treatments when a 1 second swallow with an allergy pill or nasal spray use works just as good. Intranasal noninhaled carbon dioxide for the symptomatic relief treatment of seasonal allergic rhinitis. J Allergy Clin Immunol. Volume 121, Issue 1, Pages 105-109 (January 2008).